LONDON--(BUSINESS WIRE)--Quantzig, a global analytics solutions provider, has announced the completion of their latest customer analytics study on the financial services industry. The client, a leading financial services provider, wanted to sustain their position in the market. The main objective of the financial industry client was to understand the existing customer’s buying patterns and retain them. Additionally, the client wanted to recapture and retain their customers and offer a better customer experience. The rise of digital technology has dramatically altered the landscape of the financial services industry. All the activities like offering financial planning and trading applications through smartphones and social media have provided new opportunities for the financial services industry. The customers have easy access to all the information and expect superior service from the financial service firms. Most of the organizations are adopting customer analytics solutions to devise effective strategies to identify and retain potential customers. The solution offered by Quantzig helped the client to identify customer risks, minimize attrition, and enhance operational efficiencies. The client was able to forecast customer demand and improve marketing strategies with the help of customized offerings. In addition, the financial services client was able to build strategies to drive sales, optimize marketing campaigns, and measure ROI. Quantzig is a global analytics and advisory firm with offices in the US, UK, Canada, China, and India. For more than 12 years, we have assisted our clients across the globe with end-to-end data modeling capabilities to leverage analytics for prudent decision making. Today, our firm consists of 120+ clients, including 45 Fortune 500 companies. For more information on all of Quantzig’s services and the solutions they have provided to Fortune 500 clients across all industries, please contact us. 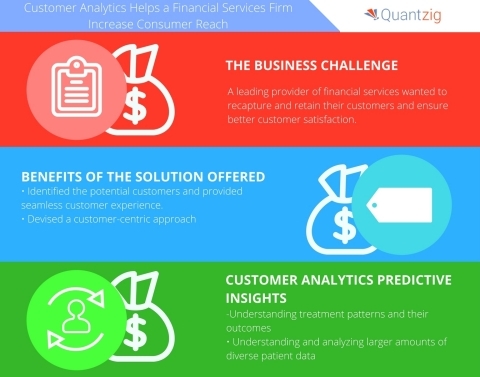 Quantzig’s customer analytics solutions help financial services firms to offer the right product, at the right time, to the customers.